It’s late. I’m in my room after the opening of the fabulous Tongan National Conference of the UCA. But until midday I’d been involved in a national consultation on remote area ministry. It began on Tuesday night. Hard work. The first time all the UCA’s players in that area of ministry had been brought together. There were tensions. Conflict. Fundamental disagreements on key issues. 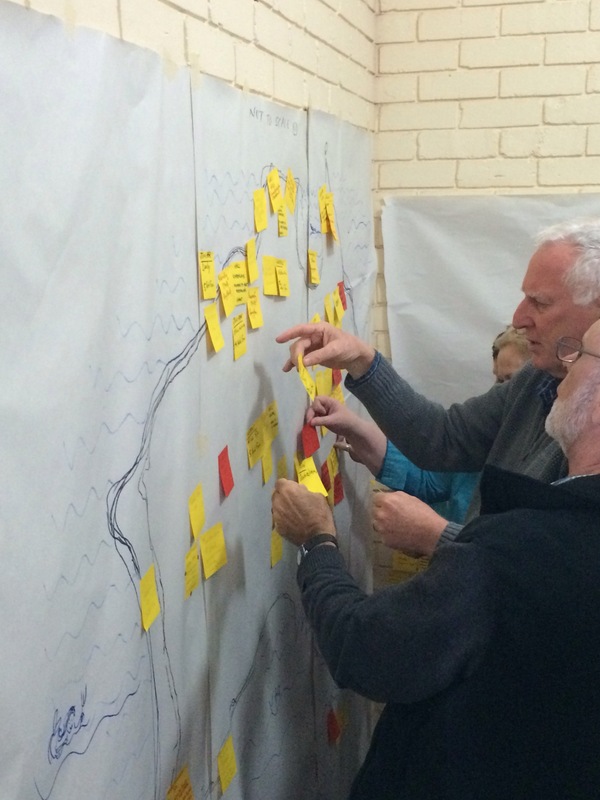 But a brilliant team of facilitators managed to enable this group of alienated practitioners to work out a common vision and some core principles for the ongoing ministry of the the church in remote Australia. Once the drafting team have got all that stuff down I’ll blog that too, but for the moment I thought I’d just share my opening remarks at the start of the gathering. We’re not here to rescue, or shore up, or salvage something precious. We’re not here to reminisce or blame or protest about events recent or distant. until we can make out in the darkness the new opportunity that God has put right in front of us. Discernment: it’s what we do. In the Basis of Union that they shaped there are some core theological principles to guide our discernment. First, God has a mission: reconciliation and renewal for the whole creation. That is the promised end in view for all things. It’s what all God’s dealings with the world are directed towards. Secondly, the church exists to serve that promised end; to participate in God’s mission. It exists for no other reason. It’s all about mission. But let’s be clear. It’s God’s mission, not ours. (There’s an axiom in contemporary missiology: The church doesn’t have a mission. Rather, the missional God has a church.) And whatever its condition, the church is called into being by God to be a foretaste, sign and instrument of the promised end of that mission: reconciliation and renewal for the whole creation. Whatever the church’s condition. And we know a few things about the condition of the UCA. For example, we’re a fraction of the size of the church of the 1970s, let alone the church of John Flynn’s generation; our centres of vitality are especially in several of our Indigenous communities and in the migrant communities that connect us to the thriving, suffering church of the global south; the largest proportion of our congregations (41%) are in rural areas or small rural towns; our national footprint includes a vast network of community services; etc. But whatever our condition, we’re called to be a foretaste, sign and instrument of “that reconciliation and renewal which is the end in view for the whole creation”. There are any number of ways of being that foretaste, sign and instrument… and sometimes our familiar ways of being that cease to be among them. So (and this is a third core theological principle from the Basis of Union that is relevant to our process of discernment): “The Church is a pilgrim people always on the way towards a promised goal; here she does not have a continuing city but seeks one to come.” Discernment includes asking which of our treasured perspectives or practices we need to put aside and leave behind. In this context, the axiom of contemporary missiology speaks to us: Since “mission” is discerning what the Holy Spirit is doing and joining in, the first practice of mission is discernment (James Dunn). That’s what we’re here for, to discern what the Holy Spirit is up to in remote Australia. Then we can work out how to join in. So, what is the Holy Spirit doing in remote Australia…? Next Is there a Uniting Church theology?